Congratulations to Perlmutter, Schmidt and Riess for being award the 2011 Nobel Prize in Physics for the discovery of the accelerating expansion of the Universe. For nearly a century, we have known that the Universe is expanding as a result of the Big Bang about 14 billion years ago. However, their discovery in 1998 that this expansion is accelerating is astounding and has turned cosmology on its head. By studying more than 50 distant supernovas over time they discovered that not only is the universe expanding, but at an ever-accelerating rate. Supernovas are exploding stars similar in mass to the Sun but much denser. Supernovas can briefly outshine a whole galaxy. What they discovered was that their light was weaker than expected—a sign that the expansion of the Universe is accelerating. When we look at distant galaxies and supernovas we see that they are moving away from us, and more distant ones are moving away faster so really its not just an expansion away from us. Everything is moving away from everything else—space itself is getting bigger. Estimated distribution of matter in the Universe. One would expect the expansion of the universe is something that would slow down, due to the gravitational attraction of every object to every other object in the universe. But we are not completely baffled. Einstein, in his general theory of relativity, predicted that even empty space has energy—what we call dark energy. The acceleration is thought to be driven by dark energy, but just exactly what that is remains perhaps the greatest mystery in physics today. 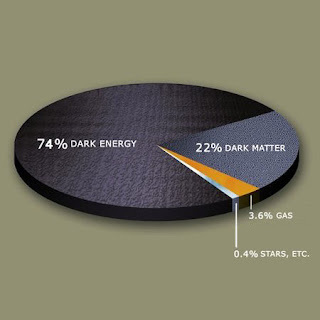 What is known is that dark energy makes up about 74% of the Universe. This dark energy pushes space itself and causes distant galaxies to move away from us faster and faster, and this is where the acceleration comes from. So cosmologists are attempting to understand what is going on. Is it really dark energy or some modification of that, or is it a modification of Einstein’s theory of gravity? Either way, it appears that the Universe will continue to expand, and galaxies will continue to move away from us. In 100 trillion years the last star will go dark and the Universe will become a very cold and lonely place. It reminds me of the science fiction short story "The Last Question" written by Isaac Asimov in 1956. In the story, the supercomputer known as AC was asked how the threat to human existence by an eventual heat death (lack of free energy) can be averted. Every time the question was posed, the computer responded "insufficient data", but in the last scene, the god-like descendants of humanity watch as the last stars flicker out as the Universe approaches its heat death. Humanity asks the computer one last time and even though it cannot answer, it continues to ponder the question even after all life ceases to exist. Eventually the computer comes up with an answer, but since there is nobody to report it to, it decides to show the answer by reversing entropy. The story ends with "And AC said: 'LET THERE BE LIGHT!' And there was light—"